By Chris Williams: Vasyl Lomachenko won’t be fighting on August 25 as originally planned by Top Rank promoter Bob Arum. 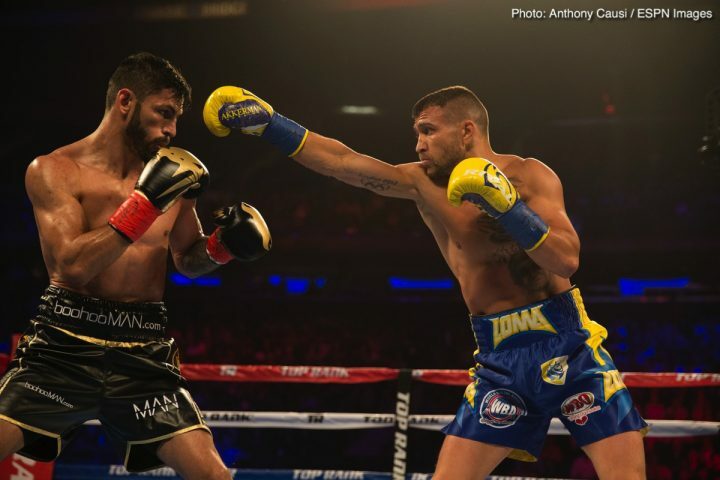 The promoter said after Lomachenko’s victory over WBA lightweight champion Jorge Linares on May 12 that he would be facing WBO 135lb champion Ray Beltran (35-7-1, 21 KOs) in a unification fight. Lomachenko, 30, and his manager Egis Klimas will instead meet with Arum in his HQ to discuss his future, according to ESPN. Arum still expects Lomachenko to fight the 37-year-old Beltran, who he promotes as well, but he’s not saying when that fight will take place. There’s not much interest in the Lomachenko vs. Beltran fight by the boxing public. rum told ESPN that there has been a change of plans and that Lomachenko will not fight this summer. Arum had intended to match Lomachenko in a unification fight with fellow 135-pound titleholder Raymundo Beltran (35-7-1, 21 KOs), who won a vacant world title in February. “Lomachenko will not go on Aug. 25, but it’s still possible that his next fight will be a unification with Ray,” Arum said to ESPN.com. The fight that Lomachenko needs to be insisting Arum make is against WBC lightweight champion Mikey Garcia. That’s an interesting one that would get fans excited, because there’s a chance Lomachenko loses. Lomachenko-Beltran is basically the same type of mismatches that we’ve been seeing from Lomachenko’s fights. Beltran is arguably Miguel Marriaga 2.0. There’s nothing to see here that we haven’t already seen. If Lomachenko does take that fight against Ray Beltran, it would be more of a situation where he’s helping out Top Rank by fighting one of their stable fighters rather than it being a fight that would do anything for his career. The fighters that the boxing fans want to see Lomachenko battle is WBC champion Mikey Garcia, Manny Pacquiao, Gervonta ‘Tank’ Davis, Miguel Berchelt, Regis Prograis, Jose Ramirez, Kiryl Relikh, Sergey Lipinets, Terence Crawford Errol Spence Jr. Beltran is not a fight has any real live to it. He’s already been beaten by Ricky Burns, Terence Crawford, Luis Ramos Jr., Sharif Bogere, Ammeth Diaz, Agnaldo Nunes, Steve Trumble and Victor Manuel Mendoza. There’s nothing that Lomachenko can gain from fighting Beltran other than winning his WBO paper belt and making Arum happy. The only fighter that is worth Lomachenko competing against at lightweight is Mikey Garcia. There’s no one else that will help Lomachenko’s career in that division. Guys like Beltran, Robert Easter Jr., Yvan Mendy, Luke Campbell and Richard Commey aren’t popular enough for Lomachenko to gain anything from fighting them.